I got a nice surprise when I went to pick up my mail from the post office on Friday. Well, to tell you the truth, I actually had THREE surprises. One came from Alan, which is somehow related to this. Thank you Alan...took a while, but at least it's here! The second surprise is from the owner of said blog, who also happens to be the owner of this blog, as well as the owner of this one AND this one!!! Talk about prolific writer. She's sweet, she's funny...and she's Santos...and I think we're about the same age. Thank you so much Santos! The last surprise came in the form of a couple of books that I had ordered as a birthday present to myself -- they were actually belated gift purchases. 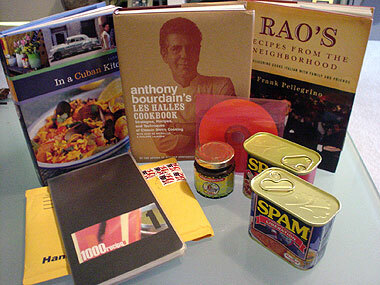 From top left, In A Cuban Kitchen by Alex Garcia, Anthony Bourdain's Les Halles Cookbook, Rao's - Recipes from the Neighborhood by Frank Pelligrino; two cans of Spam® (one Hot & Spicy and one limited edition can commemorating Guam's Liberation), a bottle of Jamaican jerk seasoning and a CD (in pink) from Santos; AND last, but certainly not least, the 1000 Recipes book (BOOK 1 no less) that I've been waiting so long for! And another surprise: check out the current HONOLULU WEEKLY. They have a feature on local blogs, including yours! As another Oahu resident who loves to eat, I've been following your blog for a while, but never posted a comment before. I'm inspired to start my own food blog as an outlet for sharing my "weird" hobby of taking pictures of my food..never got around to it though. Plus, my pictures make the food look like it's radioactive...ah well..
Keep up the great "ono kine" pictures and blogs! Reid, yeah I certainly took more than my fair time with book #1, but I'm glad it made it to you safe and sound. Congrats on the mention in the Honolulu Weekly. I had a brief exchange with the article's author, and it sounds like you were a primary source for him. My additions to Book 1 are not too special! I hope we all get to see the results of all the books soon. You should definitely start a blog, especially a food based one. Here in Hawaii, I find that there aren't many of us who love to eat, and take pictures of our food, AND post them on the web! =) We just love to eat, don't we? I didn't actually have the opportunity to talk to Larry. The only thing I did was send him an e-mail. In fact, I was trying to talk him out of mentioning my blog in his piece...I'm not really one for "exposure". Most of the folks that I work with read the Weekly, and I didn't want to be "found out". I haven't tried the Hot & Spicy yet, but I saw on the can that it has TABASCO® in it. I'm sure it's great! Thanks for the birthday wish...but I'm the one that should be thanking you for your thoughtfulness. Mmmm, Jamaican Jerk I can think of many ways to use that up!